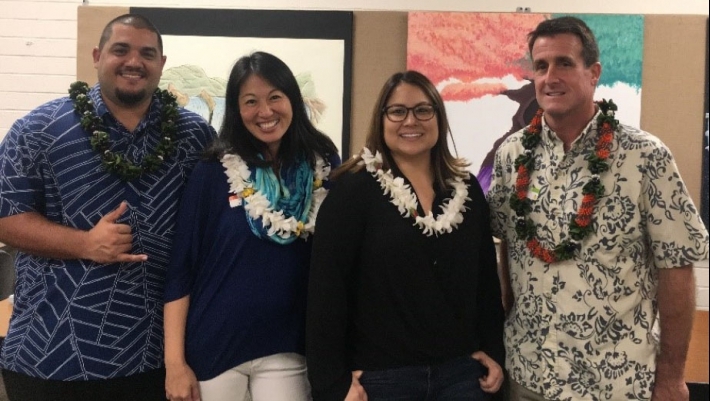 KS Communications Specialist Kyle Galdeira, Ed Hui discussion moderator Miki Tomita, DOE Communications Specialist Nanea Kalani, and UH System Communications Director Dan Meisenzahl helped spark discussion on education communication. More than 20 communications professionals from public and private schools, government agencies and universities gathered last week at the Hawai‘i State Department of Education (HIDOE) Office of Curriculum and Instructional Design for a panel discussion about communications in the education field. The panel featured former journalists turned public relations/communications professionals: Dan Meisenzahl – director of communications for the University of Hawaiʻi System and former TV reporter, Nanea Kalani, communications specialist at the Department of Education, and KS Communications Specialist Kyle Galdeira. Both Kalani and Galdeira were journalists with the Honolulu Star-Advertiser. Miki Tomita, founder and chief executive officer from Education Incubator moderated the discussion. Communications pros in attendance gained valuable insight into the panelists’ pet peeves as journalists as well as their tips on how to continue to foster productive relationships with the media in their line of work. Some of the education institutions that attended were Hanahau‘oli School, Chaminade University of Honolulu, and St. Andrew’s Schools. The Ed Hui helps to share common communications issues, best practices, and resources where possible. This was the second Ed Hui meeting and the group plans to meet quarterly. “As we at KS continue to partner with organizations and experts to improve the educational system for Native Hawaiians with the ultimate goal of uplifting the lāhui, it’s crucial that we take the same approach to communications,” said Galdeira.